An adult male wolf of average built, if a bit pudgy. Has an aura of mystery around him. Introverted and nerdy, but also friendly and polite. If pushed, can become curt. If REALLY pushed too hard, can be downright aggressive in response. Prefers resolving matters calmly and peacefully, but will not hesitate to use whatever magical force is necessary to defend himself, loved ones or innocent people. Or Avenge them, if need be. Science and Technology, but also Magic and the Occult. A dedicated follower of Forteanism. Fond of Science-Fiction and Fantasy. Loves Comics of American, Japanese and European origins. Major fan of Sonic the Hedgehog, but prefers the Archie Comics version over all. Plays Roleplaying Games, favoring Pathfinder, GURPS, Mutants and Masterminds and BESM. unathletic build, but working on it. White fur, thicker on top. Wears glasses over dark blue eyes. Likes comfortable clothing. Jeans or cloth pants, t-shirts and sweaters, and a long overcoat magically altered to always be comfortable in any temperature. 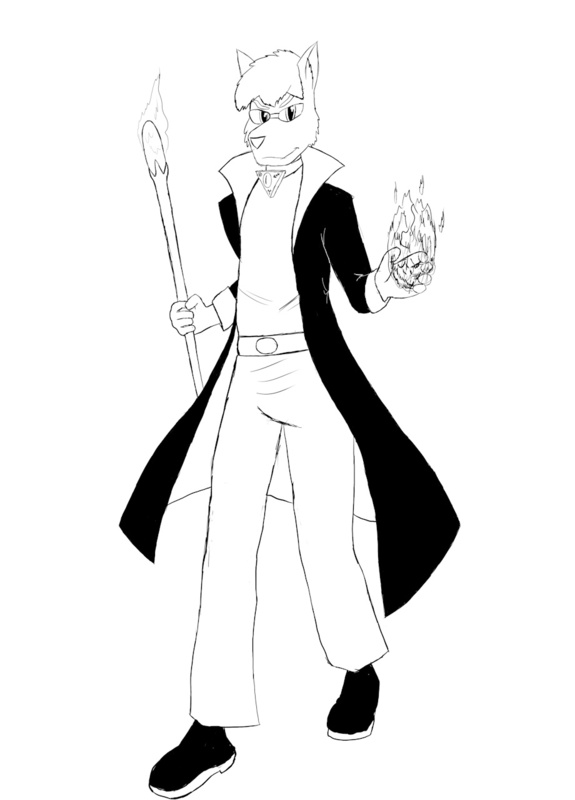 Holds a cane topped with a magical gem that acts as a focusing device/power source for powerful magics. Wears an amulet around his neck that greatly amplifies his divination and enchantment abilities. Heya folks. Decided to tweak my Fursona some more. Decided that the black-and-white fur wasn't working out, so I magically dyed my fur a tone of white. Also got myself a new staff/cane.